Eh. Holidays. I love seeing family. I HATE the crazy shopping crowds and time it makes me take. Post later tonight or tomorrow on this topic. I got permission from Hausfrau to comment on her post regarding woodstoves. I would like to discuss options for here in the high desert. Coming soon! This has been the year for DOING all that we have put off for lack of funds in years past. We finally got the house releveled, only to find that we have foundation damage and will need to spend about $1000 to get that repaired…but since it’s not an emergency type thing it is waiting til next year. We got the eaves painted, that’s needed to be done for years, and got gutters put up — it was a good excuse for me to make ready for a rainwater harvesting system also to be put in; I have two barrels of an eventual 8 barrel system already set up. It also prevents any further damage to the foundation which was caused from NOT having gutters. I bought the paint to paint the house but it of course started BLOWING as soon as I got it, so that may have to wait for an unseasonably warm day when I am off for me to work on, or may even have to wait until spring. Today, the neighbor/contractor took down our front steps, as he is pouring the footers for our new deck. This truly was an emergency — our old steps wobbled BADLY when you went up or down them, and several of the flats on the stairs would simply flip up without notice when you were walking up or down. The last thing I need is for somebody to fall when the stairs collapse as they’re coming in the front door! The price for the deck is $2200 which makes me wince, but we are paying cash for this as we have for everything we’ve done this year. So far we’re at nearly $5000 in maintenance/repair costs, and that doesn’t include my garden beds/soil/etc which can come under the heading of ‘landscaping’ (such as it is, my little redneck garden) or the chickens and coop. All of this I am happy to say we have paid cash for. It has meant not paying off credit cards and student loans as soon as I would have liked but it DOES mean that the work is done and paid for come hell or high water. That makes me very satisfied. One of the first projects for the new year is making a patio of stone and sand/flagstone in the back, and putting latex roof protectant on. Our roof is 10 years old and while it doesn’t leak, mobile homes don’t exactly have the highest quality shingles on them. Plus, with the latex roof coating, I get less of the asphalt contaminants in my rainwater. If TSHTF we are at least moderately prepared with all the big maintenance stuff completed now. Ladies: What are YOU taking with you to Camp TEOTWAWKI? OK, this post isn’t exactly what many of you were thinking I was going to be writing about. Yes, I think we all should be stockpiling guns, ammo, water, food, seeds, etc. But this post is about something near and dear to my heart: makeup. I really really really don’t want to give up makeup. The Egyptians were using cosmetics that while kinda toxic were both practical and beautiful…I want the same for myself–although for me, practical means hiding the GINORMOUS dark circles I inherited from the French/Jewish side of the family, and beautiful is kinda self explanatory. What do you all do for makeup? Have you given it up? Have you turned to ‘ecofriendly’ makeups? Which ones? How do they compare? Yep. I know. TEOTWAWKI is coming, and sooner than expected, and I’m worried about MAKEUP. Go Figure. It’s a new era in the US. Barak HUSSEIN Obama is President-elect of the United States. Hussein is an honorable name. That’s why it’s capitalized. I speak a little Arabic, it’s a beautiful language, very poetic in how it phrases things. Wow. I’m relieved it’s not McCain, after all these years of having him as our senator, I was MORE than a little worried about how he would perform as president…not to mention his age. Or his Miss Pissy Pants Wackadoodle running mate. Is now a good time to start writing to the president-elect about pressing forward with the hard things we will have to do together as a nation to avoid energy related disaster? Well we all knew the NAIS wasn’t really ever a ‘voluntary’ program, now it’s official. http://www.libertyark.net/APHIS-PIN-Mandate-080922.pdf This is the link to the full text of the USDA’s latest memo to veterinarians regarding the enforcement, against the wills of farmers, of a ‘voluntary’ program. If you want your livestock treated or checked, you will have your farm registered, your animals placed in a database, and be assigned a PIN whether you want one or not. Now, since the USDA hasn’t really made provisions for enforcement of this ‘voluntary’ program, it’s unclear how exactly it will be enforced…particularly in the states (mine being one of them thankfully) where it’s against the law to enforce it. The point is, however, that this law was pushed by the CAFO organizations — they only need to get ONE PIN for their entire herd, while a small farmer has to get a number for EVERY animal he owns. The CAFO’s already have the money and personnel to manage the databases, while the farmer will be required to purchase it and anyone who even gardens on more than the container scale will be at least slightly aware of how much time just the business of running a farm/managing crops entails. Where will they get the time for this? How will they afford the costs involved? It’s not like you make a good living from farming on the sustainable scale. Most of the farmers and ranchers I know also have side businesses. They have to, or have a spouse who works outside the home. law now for more than a year. (See ARS 3-1207 and ARS 3-1214). I recently received a copy of a Memorandum (attached) issued by the U.S.
the law to be enforced in the spirit intended when it was drafted. compelled to register their property in a government data base. Please advise me on how you plan to handle this. I applaud her courage in both sponsoring and upholding the law regarding this. The National Animal Identification System was sponsored by factory farm corporations, designed to put small farmers out of business, to force the consumer to purchase from them, the big corporations. It is being pushed by people who have financial ties to big business and do NOT have our best interests in mind. A federal judge in California actually put a cease and desist order on the USDA regarding NAIS until they could address the multiple lawsuits’ concerns brought by outraged citizens. In spite of that, it is obvious the USDA intends to push forth with this anyway. PLEASE CONTACT YOUR STATE LEGISLATORS TO EXPRESS YOUR OUTRAGE ABOUT THIS PROGRAM! It’s a multipurpose post this time. DH, Mr. Vice President, on Halloween. I don’t know why the caption doesn’t show up! 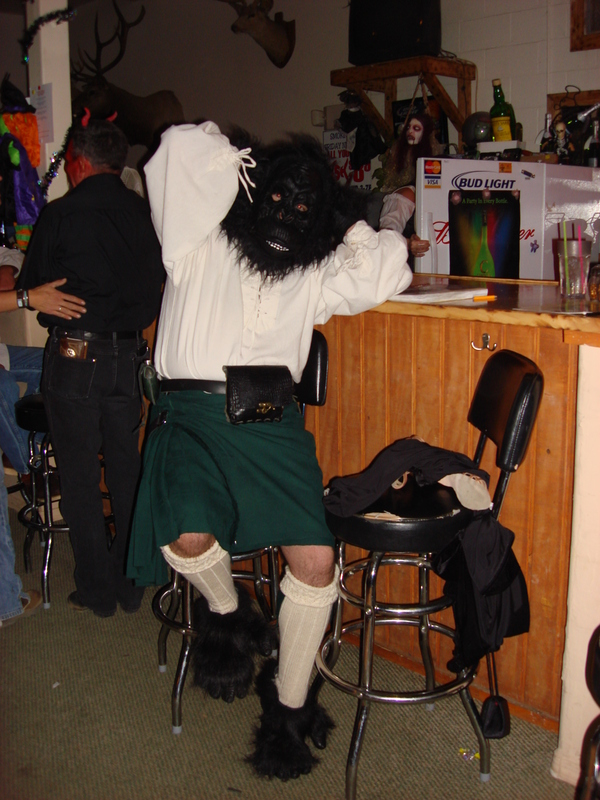 Is he a scotsman dressed as a gorilla, or a gorilla dressed as a scotsman?? More on socks: I made the kilt hose DH is wearing in the photo. They were fairly quick to make, the pattern can be found in the archives of Knitty.com. But — because they use a large size of needle and worsted weight yarn DH tells me they’re not very comfy to wear if one is standing/dancing for a long period of time due to the knobbies of the purl stitches inside the sock. My friend suggests wearing hiking liners inside the socks, but that seems to me to defeat the purpose of handknit socks — custom fit comfort. I have found this to be so on the socks I just made for myself as well, they are comfy as bed socks but I’m not sure I would want to wear them out on one of my going to town expeditions…too lumpy even with two layers of yarn as a buffer. Anniversary: Halloween was our 7 year wedding anniversary (no, we didn’t plan a Halloween wedding. A hurricane made that choice for us), and 11 years of being together. Wow. Numerologically and psychologically speaking we’re in a whole new era of our married life now. Birthdays: Oldest son turned 25 the same day his wife left him and went back to her parents’ house. Ouch. He tells me he is doing ok, cleaning and organizing and working many hours to keep busy. I worry. It’s my job, I’m the mom. Middle son turned 23 the same week, he is working two jobs just to stay afloat. He has bald spots from being so stressed he pulls his hair out. I worry. It’s my job, I’m the mom. Youngest son turned 21 also the same week (they’re two years apart, within 6 days of the same day). He still isn’t speaking to me; I’m assuming he’s doing alright since my sister hasn’t called me to ask for bail money or anything (he lives with her). I worry. It’s my job, I’m still the mom even to the kid who won’t speak to me. Children related worries are directly related to the economy, which are indirectly and directly related to peak oil. I’ve told them it’s OK if they come home, if they need to come home, it’s not their fault. They can’t control the economy. They can’t control the prices of things. Plus, frankly, I’m not going to be spry enough to paint the house and do the roof myself forever. They nod and agree that it doesn’t mean failure, but they hope it doesn’t come to that. I am not sure they’ve figured out that, all things considered, even if they need to drive more to get to a part time job if that’s all they can afford, it still means less income outflow for basic needs in the long run. Ah well. We’ll celebrate Thanksgiving together, we can talk about it then I hope. And I pray they won’t think of me as their crazy mom when we do. Planted one bed with winter crops: winter lettuce, broccoli, carrots, and cabbage. The weather has been kind of freaky, and although we had one week of fall like weather, it’s been back to the 90’s during the day so I am still getting tomato and eggplant blossoms…although I’m not holding my breath that the fruit on the eggplants will actually mature. Damned javelina rampaged through my yard and got the last crop. DH is on board for electrified poultry/goat netting, thank the Gods. It’s pricey but it’s effective and we can take it down in favor of real fence in a couple of years. Two days until the election. I don’t like either candidate. We need a candidate who will say we need to shore up our infrastructure and look after ourselves first! Somehow I don’t think either will make more than a passing show of an attempt at that. It’s a sad thing when choosing a candidate has come down to ‘which candidate do I hate less…which candidate will do less harm’ as a way of voting. I don’t think either will pay attention to the implications of the Financial Times’ article just published and reviewed at Casaubon’s Book by the brilliant Sharon Astyk. If I actually knew how to link directly to the post I would, but you can read it by looking through this past week’s archives — I have a link to her site here. Still waiting for Lehman’s to get their Best Grain Mill back in stock!!! I’ve been putting off getting a Berkey water filtration system but it’s time. We have piped water, but the quality is WAY down lately and it tastes like rotting plant matter. It may not kill me but I really don’t want to drink it — and if it tastes that bad, what’s in it that I can’t taste??? So. Who else is feeling like they are not NEARLY prepared enough for the continued crises coming our way?? ?